California and water: the two always have been, and always will be, inextricably linked. No resource is as vital to California's cities, agriculture, industry, recreation, scenic beauty, and environmental preservation as its "liquid gold." And no resource is as steeped in controversy. The fundamental controversy surrounding California's water supply is one of distribution coupled with conflicts between competing interests over the use of available supplies. Nearly 75 percent of the available water originates in the northern third of the state (north of the city of Sacramento), whereas 80 percent of the demand occurs in the southern two-thirds of the state. The demand for water is highest during the dry summer months when there is little natural precipitation or snowmelt. California's variable climate also leads to extended periods of drought followed by flooding. The basic problems of California's water supply have been remedied, in large part, by construction of one of the most complex and sophisticated water storage and transport systems in the world. An integrated system of federal, state, and locally owned dams, reservoirs , pumping plants, and aqueducts transport large portions of the state's surface water hundreds of miles. These water supply projects include the State Water Project, which originates at Oroville Dam and reservoir (located in the Sierra Nevada foothills 120 kilometers [75 miles] north of Sacramento) on the Feather River. Water from this project is transported all the way to the Los Angeles area via the California Aqueduct. The federal Central Valley Project stretches from Shasta Dam and reservoir in the northern Sacramento Valley to the Bakersfield area in the San Joaquin Valley. 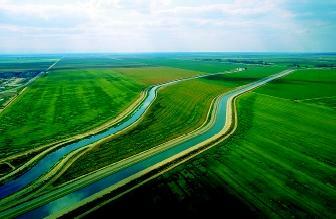 Farms in the agriculturally rich Central Valley use 80 percent of its water. Southern California also relies on water from the Colorado River, drawing its supplies from the historic Hoover Dam. Six other states, the Republic of Mexico, and American Indian tribes also share water from the Colorado River. Groundwater as a Supplementary Supply. Supplementing surface water is groundwater , which provides one-third of California's water in an average year. Many homes in rural areas as well as some major cities rely exclusively on groundwater. Contrary to popular belief, groundwater does not exist in underground lakes but in the pores and spaces between alluvial materials (such as sand, gravel, silt, or clay) in water-bearing formations called aquifers. California's rise to preeminence as the nation's most populous state, and sixth largest economy in the world, has largely depended on its ability to develop and manage its water resources. Projects were built to control floods; store water for droughts; produce hydropower, a relatively pollution-free source of electricity; provide water recreation; and supply water to farms and cities. The negative side of this development is that California's rivers, streams, natural marshlands, and the wildlife inhabiting these areas have been significantly altered or destroyed. Although society once favored such development, public values shifted in the 1960s and 1970s as people became aware of environmental changes that had occurred in California and elsewhere: namely, declining wildlife; increasing pollution and urbanization; destruction of stream habitats; and alterations of natural stream flows. Congress and the California Legislature responded to environmental concerns by enacting a series of powerful laws designed to protect endangered species, clean up polluted rivers and lakes, and protect and preserve open spaces and wilderness areas. Environmental organizations sued to enforce such laws. The California Aqueduct serves millions of urban, rural, and environmental and agricultural users throughout the Golden State. Shown here is the aqueduct and the E-Side Canal near Bakersfield. and one of the oldest lakes in North America. Throughout its 700,000-year existence, salts and minerals have washed into the lake from streams of the eastern Sierra Nevada. This ancient saline lake and its basin supported unique and diverse fish and wildlife populations. 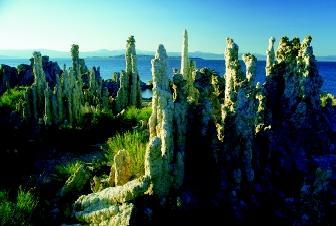 Present-day Mono Lake is more than twice as salty as the ocean, and 80 times as alkaline. In 1940, Los Angeles began to divert water from four of Mono Lake's five tributary streams. People knew this would lower the lake's level, but urban water supply had a higher value than the environment. By 1990, the shrinking Mono Lake had doubled in salinity and lost a number of freshwater habitats such as delta marshes and brackish lagoons that formerly provided lake-fringing habitat for millions of waterbirds. In 1979, environmentalists sued after Mono Lake's level dropped 12.2 meters (40 feet), jeopardizing its bird and brine shrimp populations. In a 1983 landmark decision, the California Supreme Court held that the public trust doctrine applied to Los Angeles' diversion, and state officials reduced the amount of water the city could divert. Environmental values had gained precedence and helped transform California's approach to water management. Today the public trust doctrine is being used to protect the natural values of lakes and waterways statewide. Stakeholders in Water Management. By the 1980s, California's water community was divided into three basic stakeholder groups: agriculture, including farmers and irrigation districts; urban, including municipal water suppliers and city officials; and environmental, including conservation groups such as the Sierra Club. While these three groups continue to have major disagreements over water use and restoration of the natural ecosystem, they have made attempts to find solutions that all can accept. Finding such compromises is one of the biggest challenges facing California water policymakers. The state faces other major challenges such as making sure there is enough water to supply the estimated population boom; reducing the amount of nonpoint pollution (for example, polluted runoff from roads and farm fields); and removing pollutants from drinking water. Calcium-bearing springs below the surface of Mono Lake, California well up through the alkaline lake water, which is rich in carbonates. The calcium and carbonate combine, forming calcite deposits on the lakebed. Over many years, a porous deposit known as tufa accumulates around the mouth of the spring from the ongoing deposition. As the lake waters recede, the tufa formations are exposed, sometimes towering as high as 10 meters (about 30 feet) above the lakebed. Some of the largest tufa towers are between 200 and 900 years old. the U.S. Geological Survey, which conducts scientific research into the quality and quantity of streams, lakes, and aquifers. SEE ALSO Balancing Diverse Interests ; Colorado River Basin ; Florida, Water Management in ; Hoover Dam ; Legislation, State and Local Water ; Rights, Public Water . Hart, John. Storm Over Mono: The Mono Lake Battle and the California Water Future. Berkeley: University of California Press, 1996. Hundley, Norris. The Great Thirst: Californians and Water, rev. ed. Berkeley: University of California Press, 2001. McClurg, Sue. Water and the Shaping of California. Sacramento: Water Education Foundation and Heyday Books, 2000. Mono Lake Web Site. Mono Lake Committee. <http://www.monolake.org> . California Issues. Water Education Foundation. <http://www.watereducation.org/california.asp> . The most extensive aqueduct system in the world is the one that supplies water to southern California. This aqueduct system of canals, pipelines, and tunnels was begun in the 1960s. Other major aqueduct systems that extensively supply water to major populated areas include the ones located in New York City, Boston, Massachusetts; Baltimore, Maryland; Washington, D.C.; St. Louis, Missouri; and Los Angeles, California.